We got samples and A10s-SDK which unfortunately again is with binaries and not GPL sources, but according to Henrik Nordstrom (a.k.a. hno at #olimex IRC channel) Linux-sunxi sunxi5 should work with A10s. As price A10s is positioned between A10 and A13 i.e. lower cost than A10 but higher than A13. As we are at very early stage of the design we can’t say when exactly we will have A10s boards. Also these are not very suitable for production at home 🙂 as A10s comes in 0.65 mm pitch BGA package which requires 0.2 mm drilled vias for escape and not all factories can reliable manufacture such PCBs, so we have to carefully evaluate where the blank PCBs to be manufactured as these specs exceed our blank PCB production technology limits. Another exciting preliminary information we got from Allwinner today is that in December they will announce their new Quad core A4X Cortex-A7 processor. They didn’t gave any other details than the specs and samples will be available mid December, but I guess this is their answer to the Rockteck recent dual core RK3066! May I ask more about the A10s-sdk ? Is it android ? If it is which version ? Thanks. Are you going to drop the previous A10 board now? And when do you now think the A10 boards will be available ? Last I heard was back in september ? Can you update us regarding your early plans to build a board with the Quad Core Cortex A9 Freescale i.MX6 SoC? Freescale uploaded more than 6000 pages (yes, 6000!) of documentation that is freely available on their website. And the cost of the chip i.MX6Q is around 30 USD in small quantities (100 pieces). What will be the approximate price? It will be possible to have a Linux – Debian easy to install? Probably sagt3k asked for the approximate price of A10S-OlinuXino, not the A10S SoC itself. What happened with the early plans to release iMX6Q-OLinuXino? Freescale published more than 6000 pages documentation on there site available to anyone and their price list is there too. MCIMX6Q5EYM10AC is $29.76 in 100 pieces quntities. There are other models too but I don’t know what is the difference. iMX series seem to have the best documentation and support. Heard of OlinuXino products while searching for Raspberry Pi alternatives 🙂 my project is to use a board like the A13/A10/Pi as a media player for high quality audio files (flac/wave & the not so good but universal mp3) up to 24bits/96kHz (maybe 192kHz). In short, does the A13 and the soon to be A10 (the one I like more) can drive such DAC ? (via USB/USB to SPDIF or I2S) ? Does it seem to be particularly difficult (hardware & software) ? I’ve seen that there is 4 GPIO (u mad !) hope there will be possibility to have I2S. Last question for the end, which book or website do you recommand for advanced learning in order to play with the A13/A10 ? Now its name is Allwinner A31. 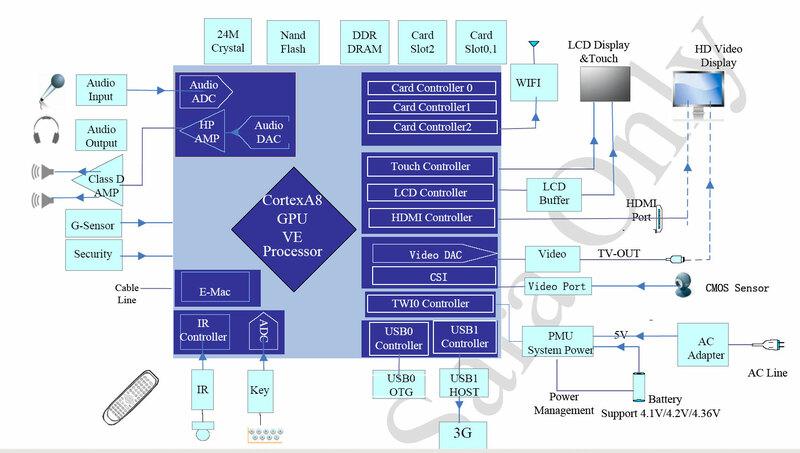 Quad-Core Cortex-A7 ARM Processor SoC.